Safeguarding against the inevitable requires a clear understanding of your cyber risk factors. But how do you determine that number? 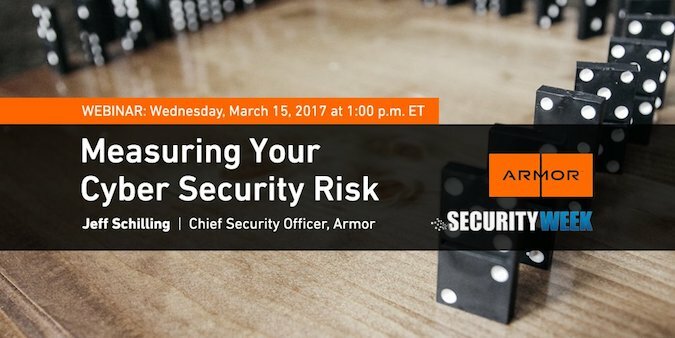 In this on demand webinar, Jeff Schilling, Chief Security Officer at Armor, explores a simple equation that helps protect organizations by identifying their cyber risk. Speaker: Chief Security Officer at Armor, Jeff Schilling (Col., rtd.) is responsible for the cyber and physical security programs for the corporate environment and customer hosted capabilities. Jeff retired from the US Army after 24 years of service in July 2012. In his last assignment, he was Director of the Army's global Security Operations Center under US Army Cyber Command, where he was responsible for synchronizing the global security operations/monitoring and incident response for over 1 million computer systems, on 350 wide-area networks, supporting all Army organizations in more than 2,500 locations.